Christmas is a special time of year for celebrating with your family and even more so when it’s your baby’s first Christmas. If you’re gearing up for your first seasonal celebration with a new baby, then here are some tips and ideas on making it special, and safe, for all involved. 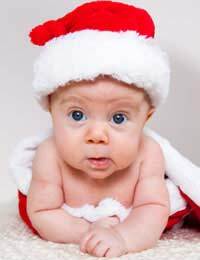 It’s not unusual for new parents to want to celebrate their first Christmas with a new baby on their own, without the usual large, extended family celebration. If that’s your idea of a perfect Christmas, then don’t be afraid to let the rest of your relatives know in advance, so that they can make their own plans and know that you’re doing your own thing. They may not like the idea much, especially if it’s a long-held tradition to all celebrate Christmas together every year, but hopefully they’ll come round to the idea and accept your wishes. You can always get together on another day in the holidays, or perhaps at New Year instead. Even if your baby is too young to understand that it’s even Christmas, let alone be interested in opening presents, it’s still exciting just to share Christmas Day with your little one on your own, without a lot of hubbub and noise. If you do want to get together with your relatives as usual, then you may gain the benefit of having someone else to share baby care and nappy changing with, leaving you the chance to have a bit of a rest. Someone else cooking the Christmas dinner is bound to be a benefit too! If you’re used to decorating your home for Christmas, then you may need to take a bit of extra care with what you put up, and where you put it, now that you’ve got a baby in the house. Depending on the age of your child, and whether they’re crawling or not, some of your much-loved Christmas decorations may now become the target of a curious baby. The bright lights, coloured baubles and tinsel are, not surprisingly, of huge interest to an inquisitive crawler, who would love the chance to feel and touch your decorations. Even if your baby isn’t yet on the move, they’ll no doubt be fond of grabbing anything they can get their hands on. You’ll need to take care when walking around holding your baby, or if they’re sitting in a high chair or on someone’s lap and become within easy Christmas decoration grabbing reach! When you’re decorating your home for Christmas, think carefully about where you put things. It might be best to avoid hanging enticing baubles on the lower branches of your Christmas tree and watch out for anything that could dangle within easy reach of your baby. Parcels stacked under the Christmas tree could also attract curious hands, so perhaps put them higher up on a table if your baby is a crawling adventurer. Your baby may well love the unwrapping element best of all – in fact, a crumpled up piece of torn off wrapping paper may prove the highlight of the day for them!